Use on my wheelchair. Extremely comfortable and retains its shape. Have had this cushion before and would buy again. and large size is good. I have MS and am wheelchair bound. This cushion is SO comfortable. I would suggest it for all wheelchair users! prefect, just what I need. Saw cushion in catalog and on-line. It was shipped promptly and is comfortable but flattened out which makes it seem too wide for my wheelchair. Perhaps if it came in a width two inches less, it would fit better after the "flattening out" occurred. The most comfortable cushions I've found. The gel insert gives added comfort if sitting for long periods and it fits my chairs very well. It would be great if it came with a zippered cover in a choice of colors that could be removed for washing. With back problems I needed a softer seat for daily use. This gel cushion has helped. Appears to be durable. I suffer from sciatica on my left leg and I have a desk job so this relieves pressure where it is needed most. Very good quality, a little too large to fit on a small chair but otherwise great!! Well made but not as substantial cushioning as I would have liked. We bought two of these--one for the wheelchair and one for the car. They worked very well until we decided to wash the covers. The covers are difficult to remove and nearly impossible to replace. Lengthening the zipper to go around one or both corners would improve the product greatly. This cushion is not as firm as I would like, and I do not think it will last as long as my 12 year old one. I will use it for two meals a day at my table. Hope it holds up. Extremely comfy for first week. Flattened to half the size thereafter. Perhaps manufacturer should indicate weight limit above 200 lbs. useful to raise seat height after hip surgery, but it seems to compress easily and I need to keep turning it over to 'fluff' - it would be nice to have a carry handle or strap for portability because I also use it other places such as in the car, church, theater, etc. Didn't fit in our chairs as we thought they would and then they are harder than we thought they would be. Too bad because we have been looking for a long time for decent chair cushions. Would not use this on a wooden chair--not enough cushion. I use it on my computer chair. Comfort only lasted a couple of months. Getting up & down out of chair makes get pack inside cushion bunch up & shift. Constantly have to unzip, remove gel pack, flatten out, then reinsert. Only good thing about it is you can remove the cover and wash. After a year, the foam insert is disintegrating. My cat loves it as a bed. Sat on the cushion at work for about 2 weeks, it is now only 1" thick. Can't even feel the gel center, not nearly the quality of my previous one I had 7 years ago. Used 3 times - product split at seam & gel leaked all over chair ruining it. after 2 weeks of use of sitting on the gel cushion at my computer it was leaking gel. The second time I used the cushion, it leaked through the covering and onto the chair. It was a huge mess. This item is not worth any amount of money. Product did not hold up well. Not made to be sat on for long periods of time. I did not like this product and have returned it. The one I had before, was slanted in the front and easier to sit on. This one I felt like I was going to fall off. I need a comfortable cushion for my chair. To promote comfort and circulation. Hoping it will help with sitting for long periods. It looks like what my wife wants. I choose this for my husband because he sits for long periods of time. Mom needs more cushion on her recliner. Used one before and liked it. Requested by my paraplegic wheelchair bound son. I have an elderly mother who needed a gel cushion seat. We have been checking different location, site and medical supply store to find my mother the right gel cushion seat that she needs. This was affordable and looks like the gel cushion seat that she need which was recommend by her Doctor. My husband sits all day & is getting sore's, wiling to give this a try. For my back. Still use it. I hope the positive reviews are correct and it will be a durable, comfortable cushion. My mom sits at her table for long periods of time coloring so I hope this helps with sores. To try it in my office work chair. I sit all day and have been having sciatic pains for over a month. Wanted to give it a try and see if I can get any relief. The size (incl. thickness) and the fleece on one side. My mom needs a cushion for her recliner. I sit a lot!!! 8 hrs. daily, on my job, and at home when on my computer. This is first time I have ordered this cushion. I have back problems and need a good cushion to use while setting in recliner, in car. and desk chair. too short. Need to get closer to the table, etc. Sits for long periods in stadium chair. Has back problems when sitting with a cushion. 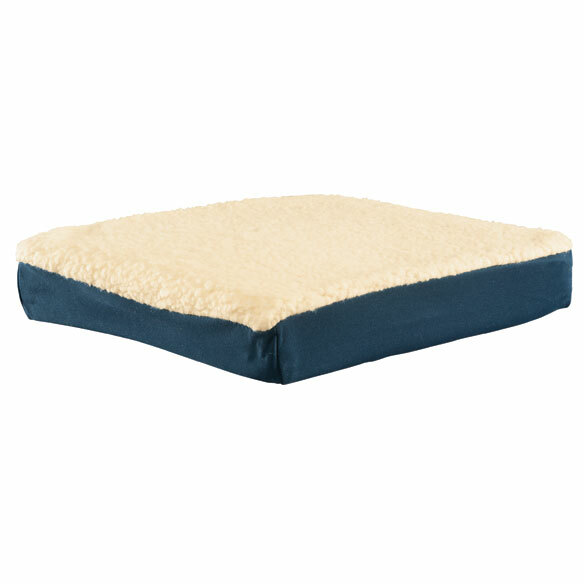 Do you have a LARGE gel foam cushion? BEST ANSWER: Thank you for your question. This item measures 16" long x 18" wide x 3 1/2" high. We do not offer this item in a larger size. We hope this information will be of help to you. BEST ANSWER: Absolutely can be washed. The "problem" is getting it back on the cushion, takes a little patience, pulling and tugging. would like coushion 16 x 16 if possible , is there two possible? BEST ANSWER: Thank you for your question. No, there is not a 16 x 16 cushion. We hope this information will be of help to you. can I get this pad for a wheelchair? BEST ANSWER: Thank you for your question. That depends on the size of the wheelchair. 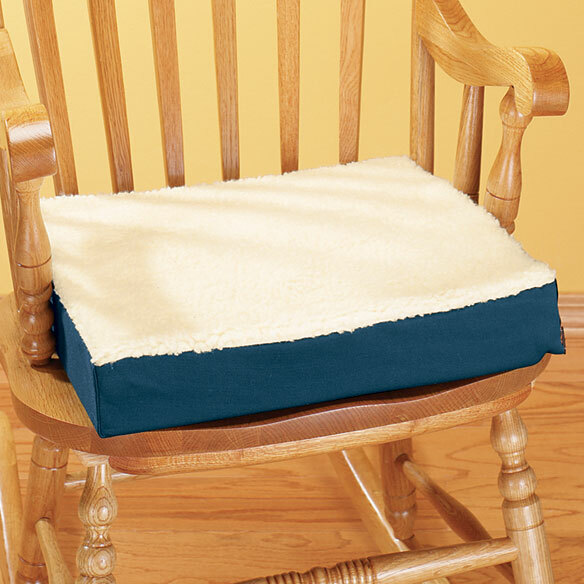 The Seat Cushion is 16"L x 18"W x 3 1/2"H. so if your wheelchair can fit that size then the cushion will work for you. We hope this information will be of help to you.